The Shandwick stone (or Clach a’ Charridh) is a Pictish cross slab (class II stone) from the village of Shandwick, Tarbat Ness, Easter Ross. It is situated above the village, with the cross facing out to sea. The stone is c8th century and is over 3m tall. The cross slab was split and repaired following a storm in 1846. 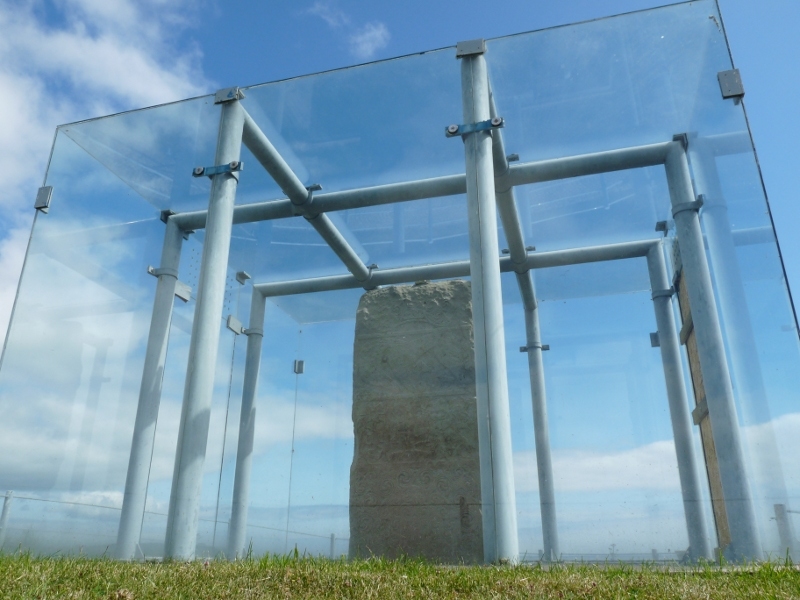 Currently, the stone is housed in a glass box to prevent weathering, however this makes it difficult to photograph. The cross side of the monument features a Celtic style cross with beast, angels and intertwining snakes. The opposite side of the stone is made up of six panels. The bottom two panels of complex Celtic motifs have been partly obscured by the modern base. The panel above these contains a highly complex design made of intricate spirals. Above this, is the so-called ‘hunting scene’ – a bizarre mix of figures, some animal, some human and some fanciful. 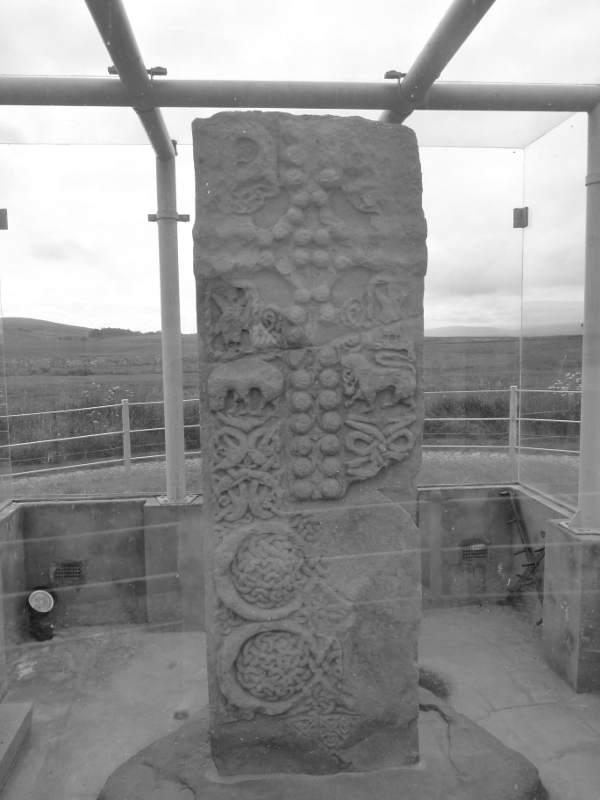 The two panels at the top of the stone feature Pictish symbols. 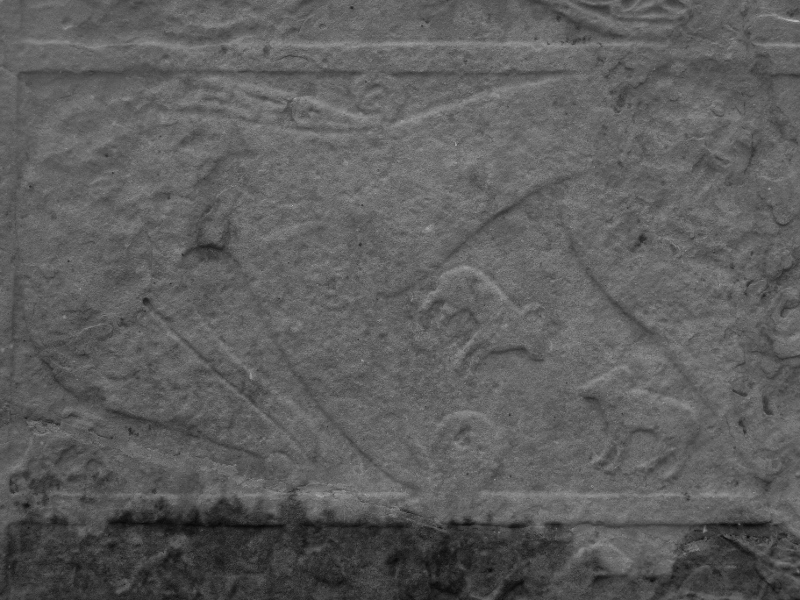 The top panel has a double disc symbol, and the one below the ‘Pictish beast’ symbol or ‘Picitsh Elephant’. Note the ‘trunk’ of the beast features a elephantine wrinkles. 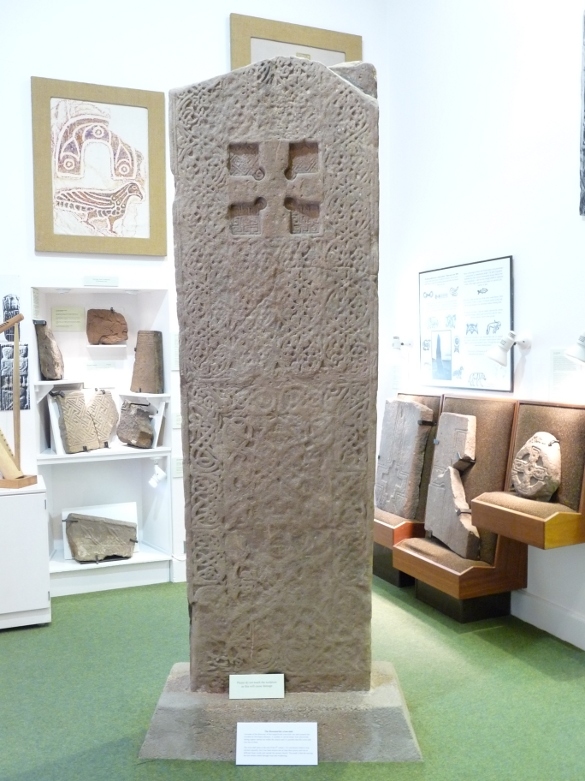 The Rosemarkie stone is an 8th century Class II Pictish stone (Cross Slab), probably associated with the Pictish monastery at the Rosemarkie, Easter Ross. It is currently located in the Groam House museum in Rosemarkie. Groam House: http://tinyurl.com/3hxcfb9 The front has a cross in its upper portion, with intricate Celtic designs. 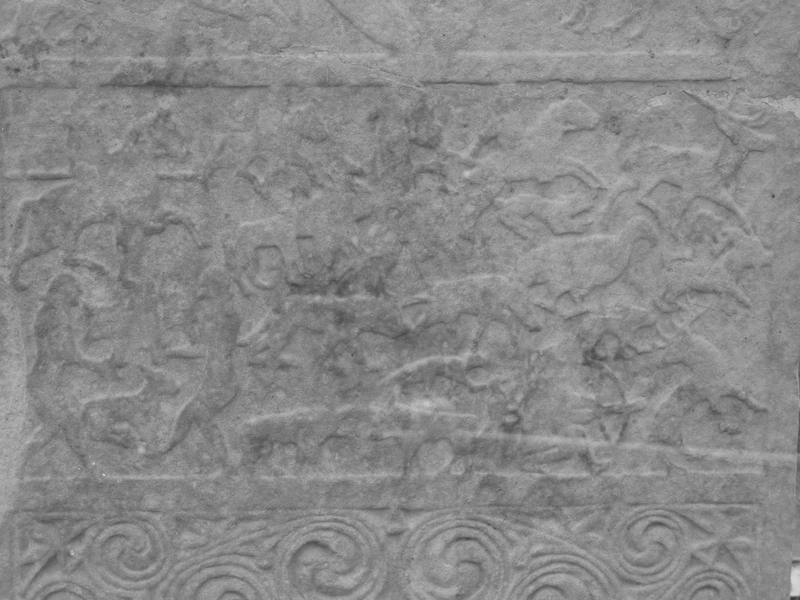 The reverse side has four Pictish symbols, probably arranged as two pairs. Top pair – two crescents and v rods (most of the top most symbol is missing). Bottom pair consists of double disc and z rod paired with crescent and v rod. There are also a mirror symbol and possibly an oil lamp symbol below the main symbols. Below this is another cross, again surrounded by intricate designs. Were they really the savage barbarians they’re usually portrayed as? What were their mysterious symbol stones for? What do the symbols actually mean? Hopefully some of these questions (and more) will be answered in this blog. Most importantly, I hope that you will become as enthusiastic about the Picts as I am. The Picts lived in northern and eastern Scotland over 1000 years ago. Words such as ‘mysterious’ and ‘enigmatic’ have been used many times in the past to describe these northern tribes, reflecting on how little is known about them. They left little or nothing in terms of written records, at most a few indecipherable fragments incised on stone monuments written in the ancient Irish script ‘ogham’ (pronounced o-am). Most of what we know about them derives from three sources; firstly, accounts written by their contemporaries – notably the Romans, Irish, Welsh and Anglo-Saxons, secondly from archaeological evidence and thirdly from their spectacular art found principally on symbol stones, scattered across the Scottish countryside. 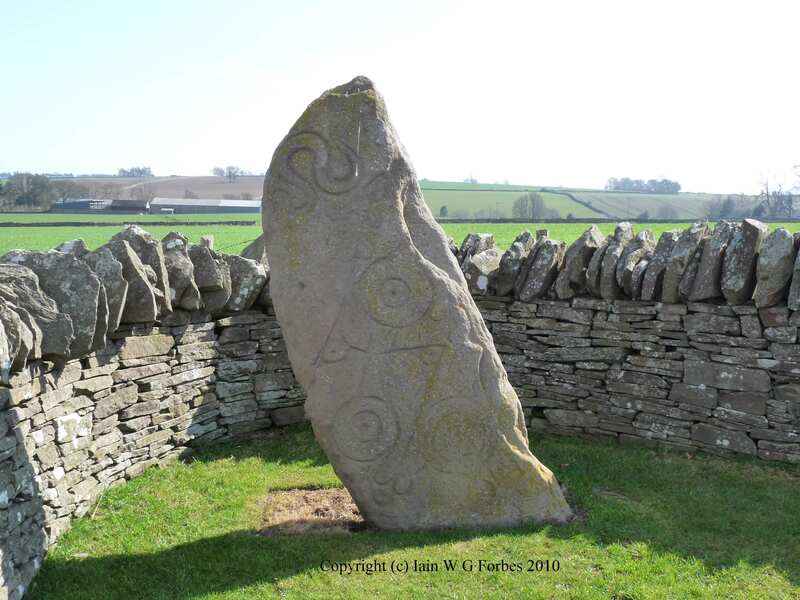 In this blog, I am going to concentrate principally on the Pictish symbol stones, not only to emphasise their beauty and craftmanship but to explore something of their meaning. I will also include my own pictures of stones that I have visited as well as links to other pictures from other websites. In the next few months I will also provide the reader with more information on my forthcoming book on Pictish symbols, which will hopefully answer many of the questions on their function and meaning. Image below: Aberlemno 1, Angus. 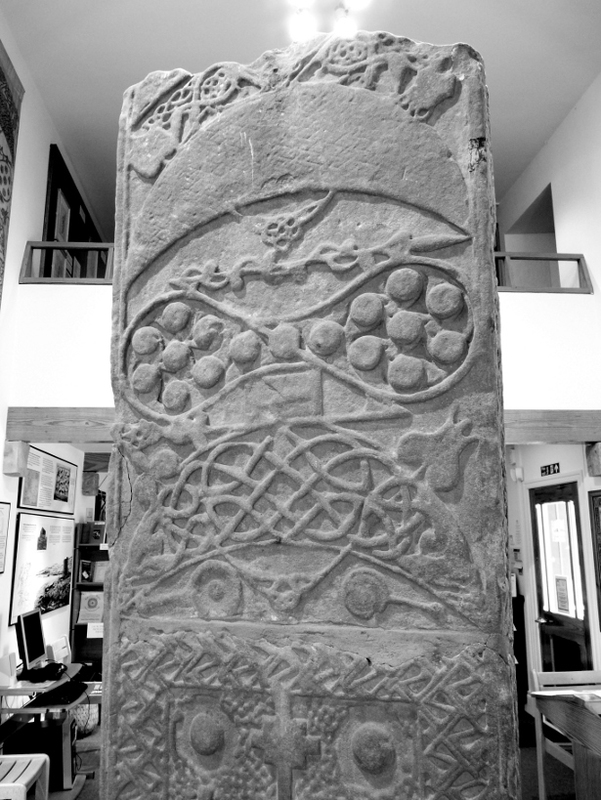 A so-called class 1 stone (see section on Pictish symbol stones for explanation of classes), featuring a serpent, a double disc with z-rod and mirror and comb symbols.